Our yearly pilgrimage to the Maya lands this year evolved to a whole new level. Retrogrades and eclipses fueled the pre-tour intensities. We were traveling directly after our US commander, Chief GWB, who visited Guatemala a few days prior. Not an unusual occurrence for us. For some strange reason, unclear to us, presidents seem to be in the same areas we are, over and over, year after year. A few in our group decided to arrive into Antigua early. I thought I would catch a couple of days rest before our 2 week journey to Tikal, Quirigua and Copan. But Spirit had other things in mind for us. We arrived just a few days behind GWB. 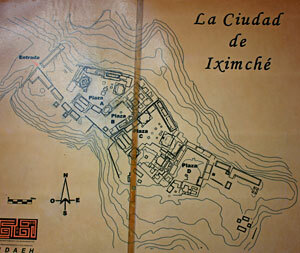 "The Prez" visited a Maya site called Iximche', which is located in the area of the Kaquchikel Maya. It so happened that the local volcano did not feel good about this event and began to protest by threatening to blow. It puffed smoke as a warning. This disturbed the Maya understandably. 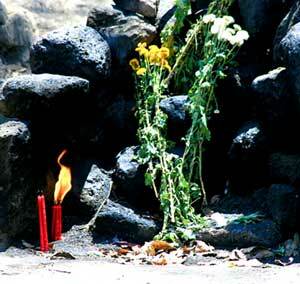 They felt a great need to perform ceremony to clear the bad spirits from the site. Well . . . we had to go. I felt a strong calling to go to this site to make my own apologies to the site. We made arrangements with a small tour company for our transportation to the site the very next morning. The next day we were greeted by our driver and were surprised by the fact that he was ½ Kiche Maya and ½ Kaquchikel Maya. These were the two original Maya cultures in Guatemala. Once admitted enemies, now our driver Antonio proclaims that they are "in Love". As we entered Iximche', we allowed ourselves to tune into the site. I could not feel GBW's energy there at all. Maybe it is because he is so unconscious. I don't know. We were all drawn to the back of the site. There, just outside the main temple area, was an area where the Maya were allowed to do ceremony. We had arrived just as a group of Kaquchikel Maya had completed their fire ceremony. The smell of melted candles was still wafting in the air reminding me of a powerful time in ceremony with the Maya in year's past. Raphael and I sat by the dwindling smoke feeling overwhelmed of embarrassment and grief. The Maya Priests, only a few yards away, were resting under some shade. I could feel their anger at the US and US citizens. I gathered up my courage and decided to walk over to introduce myself. As I neared them, I could see them brace themselves wondering who was this American woman walking up to them. I said in my very bad Spanish "Yo lo siento mucho sobre Presidente Bush. Nosotros pensamos que nuestro gobierno está un poco loco y fuera de equilibrio. gracias por su ceremonia aquí." Translation . . . I am very sorry about President Bush. We think our government is a bit crazy and out of balance. Thank you for your ceremony here. They looked a bit confused and quickly chattered among themselves. All I could hear was ... blah... blah... blah ...President Bush! Then I could see their demeanor change instantly. The Maya women, who are usually very reserved, opened up and had tears running down their faces. They said THANK YOU, and asked our names and where we were from. I had brought with me, from the Lake Titicaca area in PERU, a hand woven coca leaf ceremonial bag and gave it to them as a gift. As we walked away, I felt that we left them with the awareness that at least some US citizens cared about their sites, culture and religion. It made us cry. 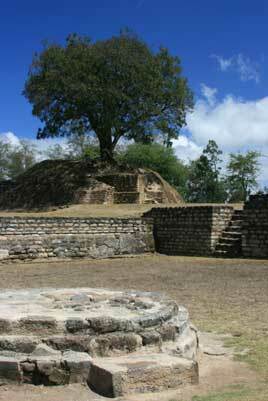 As we walked out of the Iximche' site, I became painfully aware of a simple fact. Here are a simple people who care more about what the governments of the world are doing to our planet than most US citizens. They were not closing their eyes in fear. They were not afraid to take action in any way that they could. I realized that so many people in the world today are afraid to disturb the status quo . . . instead of standing in their truth and acting from it in a way that could change the world for the better. It was a humbling and inspiring realization. I also realized that the guilt I was feeling has no place left in me to reside. Guilt is the same as being a victim and is apathy. Apathy is why the world is in the bind it is in now. It is time to take action in a way WE know how. Taking action is rising up from the powerless places we live, and puts our creative mastery into action. It is time for us ALL to quit complaining about the world, and to do something about the world that we live in. If the Maya KNOW they can change the world with their humble ceremonies, what do you suppose we can do with our combined power? What kind of world do you want? Our history starts now. Our group gathered for our first night in Guatemala City with a bit more retrograde issues like delayed flights and lost luggage. I was so glad when each person was accounted for and present. But our luxurious hotel afforded us little sleep. Many of us tossed and turned all night finding ourselves calling in the Masters and angels. Many of us spent our sleepless night working with light and filling our hotel and Guatemala City with light. The next morning we gathered for breakfast and began to realize why we struggled with sleep that first night. The hotel was filled with International Bankers for a conference. Part of the "International Monetary Fund, I think." Yep . . . we were sleeping with the enemy a.k.a. the Illuminati. The buzz was that they were gathering from around the world to buy up small countries. My guilt from the day before shifted to anger. I always grieve at the sight and realization that those with "less" are at the mercy of those who have "more". And if those with "more" don't support those with less . . . well, let us say that this is why the world is the way it is right now. We have moved away from a world that has honor and offers services, but have moved to a world that supports the illusion of service to take advantage of those who have needs. We began to realize that our last minute shift in hotels in Guatemala City was by no human error but by divine intervention. Our group of Light Workers were put to use sending light into the hearts of greed on our very first night. While they dreamed of power and control, our group unknowingly flowed light, truth and balance. As one of our group members said "Ain't Life Grand!" It sure is! These first days of our pilgrimage were just the beginning of 2 weeks of Spirit directing us in ways that we could not have imagined on our own. We became quite aware that Spirit is running the show. Spirit knows each and every heart, and knows just where to direct it so that balance and harmony can be restored. We must rise up out of apathy and the illusions of powerlessness and know that no matter how small or insignificant we may feel, Spirit does and will use our light to bring about a new world that we dream of. Each day synchronistic events cemented this fact deep into our souls. We knew that when we landed back home, in 2 short weeks, our lives would be greatly accelerated. I feel this is for all light workers. School is out . . . and now the work begins. So, what kind of world do you want? And what can you do about it now? This is part 1 from the notes on our trip . 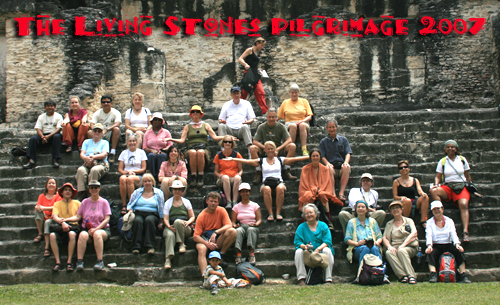 . . future issues will reveal what happened and what we learned in TIKAL ... YAXHA... UAXCHACTUN ... QUIRIGUA and COPAN.... It was a great trip. THANK YOU to our AMAZING GROUP.